“Florals? For spring? Groundbreaking.” Miranda Priestly (The Devil Wears Prada protagonist and deliverer of that classic line) may have had a point, but let’s face it, spring without florals is like gin without tonic. While perhaps not groundbreaking, this season’s florals are different. Replacing last season’s romantic petals are bold blooms that have been blown up to attention-grabbing proportions. Seriously punchy, the new florals come splashed on a black background giving the stereotypically pretty print a tougher spin. Street style star and fashion Journalist Katherine Ormerod and actress Charlize Theron are fans – follow their lead and up the cool-factor by pairing our supersized floral shirtdress with black heels. Think spring prints and you think florals, nautical stripes, possibly even some retro polka dots, right? Well, what about pineapples? From Holly Willoughby to Olivia Palermo and our statement skirt, pineapple is the print you never knew you needed but definitely do. And not just any pineapple print, jacquard pineapple print to be precise. The luxurious fabric puts a polished spin on this playful print while tapping into spring’s fling with all things metallic. A guaranteed conversation-starter, pair our pineapple skirt with a Bardot top for Olivia-inspired chic, or dress it down with a slogan t-shirt and denim jacket for a smart/casual weekend look. If you’re not jetting off to somewhere exotic this summer, you can at least soften the blow by dressing like you are. 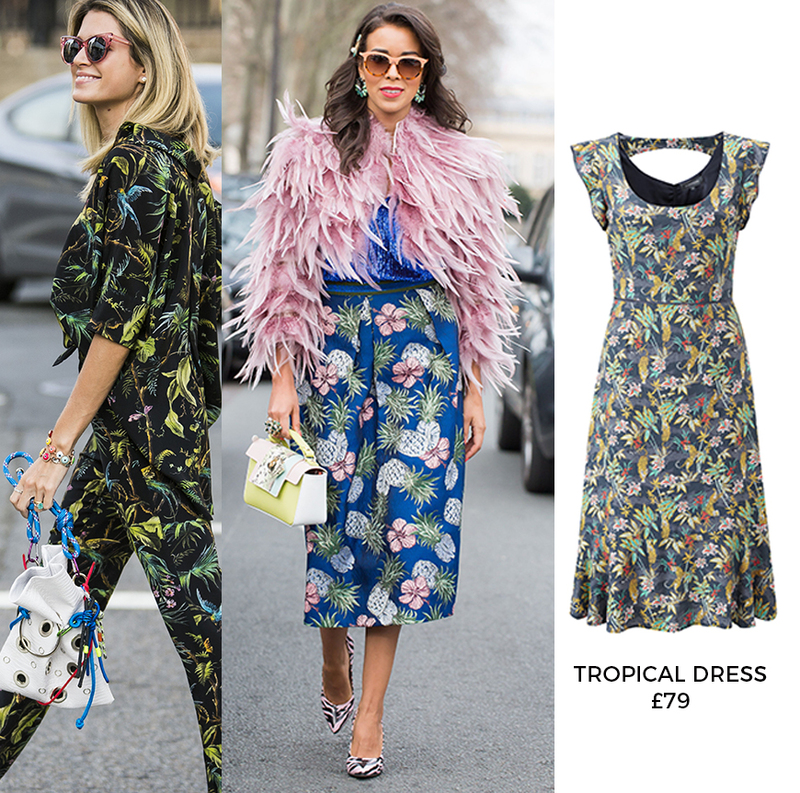 Approved by the street style set, tropical palm prints are everywhere this season, and they’re a bonafide mood booster. Think palm fronds, hibiscus flowers, and even an exotic animal or two – our ruffle trim dress is emblazoned with tropical leaves and tigers – in eye-catching colours. More is definitely more with this trend, so don’t be afraid to clash your tropical prints with a bright bag or some statement shades. For something more subtle, a pair of chic tan suede platforms is a no-brainer finisher – look out for ours coming soon.